A Smartfoam football helmet was our initial product. There was so much focus on concussions when we started our company, we thought our Smartfoam technology would be a great tool to help improve concussion research. Replacing sections of normal foam with smartfoam has resulted in the creation of a Smartfoam football helmet that can transmit impact data (location, severity, speed, and frequency) in real-time to a sideline medical staff, trainer, and parent. Measure impact starting in Pop Warner and continue until the NFL. This helmet can collect volumes of legacy data, which help everyone involved in football learn more about injuries. Knowledge will improve product design and make the game safer. 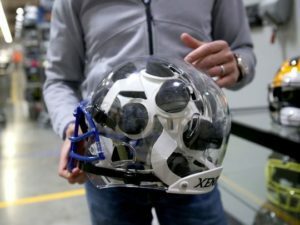 In connection with Xenith helmets, XOnano has developed a smart football helmet, which is the solution for which football is searching. The Xenith/XOnano helmet offers supreme impact protection and the ability to transmit impact data to coaches, team doctors, trainers, and concerned parents. This is an image of some of the foam we have replaced. 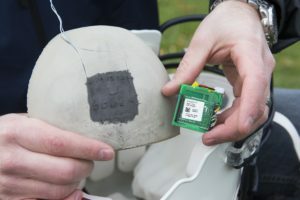 We can easily hide a microcontroller into the helmet that transmits data in real-time to the sideline. Coaches, parents, team doctors, and trainers can track the severity of impact in real-time. We are working with Xenith on a new helmet who poses the question, “Are You Ready?” With XOnano Smartfoam inside our new helmet, you will be ready. You will be able to monitor your own head health. You will know how hard you hit the opponent and how hard you got hit.